AGCO/Willmar says large units, such as this 24-ton Willmar side shooting tender, continue to be strong sellers heading into 2015. A complex set of factors in ag markets are impacting sales of — and demands on — tenders these days. To start with, crop prices are causing some dealers and growers to pause before investing in new tenders. “We think that this year’s fall in commodity prices, particularly corn, is probably the single biggest variable that started weighing down the dry tender market in late 2014. But good yields throughout most of the U.S., coupled with market stability, should enable the dry tender market to remain strong,” says Tim Tenhet at KBH Corp.
As well as tightening budgets, tender companies are facing unparalleled competition for tender purchase dollars, says Michael Tibbett of Adams Fertilizer Equipment. In fact, CropLife® contacted almost a dozen manufacturers for this story. Crop prices are also setting the tone for planting intentions this year, with some growers pulling back from 2014’s near-record acreages. Ultimately, fewer fields may need less fertilizer. Another negative market factor, adds Jon Simonsen of Simonsen Industries, is ethanol uncertainty. He says the current price of ethanol, changes in blending regulations and the rising value of the dollar has caused some concern about the sustainability of future growth in the ethanol industry. “As the stronger U.S. dollar drives down worldwide oil prices, ethanol as an alternative fuel source becomes less profitable,” he points out. Finally, delays in the construction of new fertilizer facilities has caused some dealers to push back their purchases of equipment until their new plants can be completed, says Simonsen. While challenges may lie ahead, most manufacturers we talked with reported strong or even record sales of tenders in 2014. Why? Many customers continue to consolidate locations and build their tender fleet to service larger territories from a centralized location, says Simonsen. The demands of ever-bigger farms have also created significant retailer interest in upgrading tender fleets with advanced tender traits, larger payloads, faster delivery rates and higher reliability, says Shan Kruse, general manager and director of product development at Peterson Motors Co./Quickveyor. Another sign of a tender sales boom in some quarters is the number of manufacturers that have had to increase the size of their space. Production of Willmar units recently moved to a 172,000-square-foot fabrication facility in Sioux City, IA. The move enabled Willmar production to shift from a seasonal to full-time basis to keep pace with demand for fertilizer application equipment and provide the necessary space to build larger models, explains AGCO’s Bergin. In addition, in 2015, Doyle Manufacturing is gearing up to move into its new, larger facilities near Palmyra, MO. Some tender experts feel a case could be made for a strong spring application season and accompanying fertilizer equipment support needs. For one thing, last season’s huge harvest likely tapped soils of nutrients across the country, creating a hefty fertilizer requirement going into 2015, points out Kruse. Simonsen noted that the early and unexpectedly severe cold weather restricted fall application of all anhydrous, plus snowfall across most of the northern states limited application of dry fertilizer. Bottom line: Some company reps are projecting a higher than normal demand for spring. To meet that demand manufacturers continue to crank up features that deliver increased tender productivity and efficiency. Capacity. The industry is moving to ever larger-capacity tenders — tenders that have longer-length augers that allow versatility to load any size fertilizer applicator, says AGCO’s Bergin. “Farmers and professional applicators want higher to increase productivity by covering more acres per day,” he says. Bob Eakins at Ray-Man Inc. has also seen an increase in semi-trailers with high capacities to increase payload. Plus, customers are ordering longer discharge augers to fill the larger applicators, he says. Speed. Manufacturers are constantly vying to claim the title for fastest fertilizer output. Flexibility. Tender flexibility seems to be growing in importance for buyers. They want units that can handle multiple products and multiple commodities during multiple seasons. For instance, Peterson Motors’ Quickveyor can unload into a pit during fertilizer season and easily convert back into a commodity trailer in the off-season, says Kruse. One unit that offers a number of uses is Norwood Sales Inc.’s new S3 Commercial Tender. The S3 is the first commercial tender with non-corrosive poly tanks for easy handling of dry fertilizer, liquid fertilizer, seed and water — it’s ideal for fertilizer application, planting and spraying uses, says Nate Larson, manager. The S3 has a modular tank design, and customers decide how many tanks to buy to create the right-sized tender for their operation. Each tank can hold 2,000 gallons of liquid fertilizer, 300 cubic feet of dry fertilizer, 300 units/240 bushels of seed or 2,000 gallons of water. Simpler field operation. Remote control technology is coming to tender equipment, and a number of manufacturers are offering different levels of automation here. Labor-saving devices such as electric tarps are also becoming more popular. In addition, more buyers are willing to invest in self-contained power packs. Stainless steel. More retailers are buying tenders with 304 stainless steel rather than mild steel components. Other features have grown in popularity with buyers over the past several seasons. Ronald Hays, president of Hays Liquid Transport Inc. (LTI), says customers have favored his company’s units because of their lower empty trailer weight, user safety and a design that protects tender components — increasing durability. 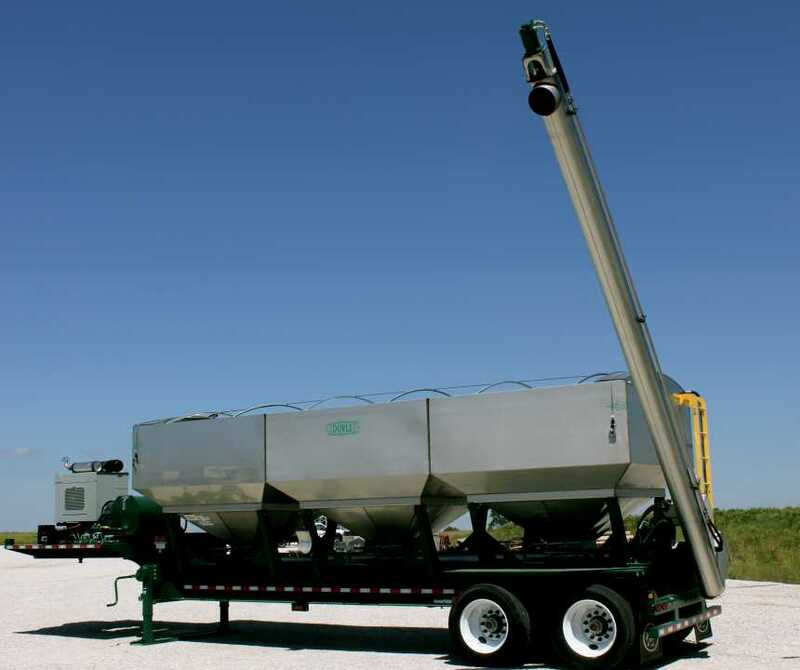 For Doyle Manufacturing customers, features most appreciated have been the company’s low-maintenance hopper design and the option to split one, two or three bins for more customization. And with the tenders’ discharge rate, “customers have seen a difference in their productivity,” says Monty Doyle, president. Tender manufacturers are offering a host of updates for the spring season, basing improvements on requests from retailers and growers. Tenhet adds this approach is not an option for everyone, “but for those folks where time is money, it should really provide a great return on its investment.” KBH is also offering a new four-compartment unit for buyers who want to apply multiple products. New for 2015, Simonsen BFT tenders are now equipped with a large pit dump/cleanout on the vertical auger transition — previously an optional feature. Also available is a vibrating cleanout. Hays is excited about the new tender designs rolling out of Hays LTI’s plant in 2015, including multi-bin hoppers and a line of smaller tenders. Peterson Motors has added — as standard equipment — several improvements to its Quickveyor to meet the demand for more “useability.” Quickveyor is now capable of unloading via the rear tube or off the front of the lower pan conveyor. 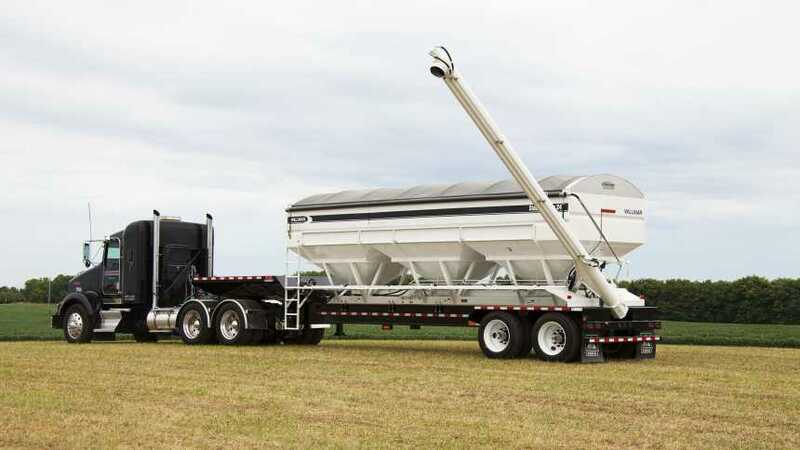 “This creates a trailer that can deliver up to four different commodities to the field and then turn around and deliver a load to the retailer’s pit,” explains Kruse. Peterson is currently testing a wireless tube video feed that will enable users within about 150 yards to “see” where the tube downspout is located to greatly improve the driver’s ability to accurately position the Quickveyor for any delivery. Norwood also has a smaller poly line — geared for farm or seed tender use — that can be pulled behind a pickup. In 2015 the company plans to offer it with an optional stainless steel conveyor, making it ideal for filling planters and spreaders.